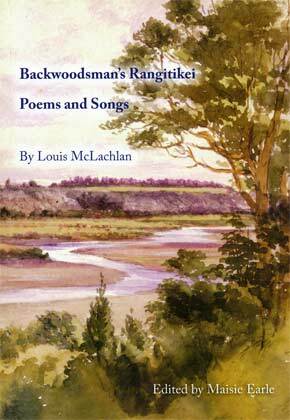 Backwoodsman's Rangitikei is one man's record of the life and people in the Rangitikei district in the last decades of the nineteenth century. Louis McLachlan was born in Wellington in 1849, the son of Dugald McLachlan and Jane Cameron, who had come to New Zealand on the Blenheim in 1840. Following Dugald's death in 1854, the family moved to Turakina, where Jane's parents had settled with a number of other Blenheim immigrants. Louis at one time farmed at Waipu, near Ratana Pa, but later worked on a number of farms in the Rangitikei area. His poems are based on his observations of the life around him - the farming life, sports, families, love and marriage, his Scottish heritage - and reflect a broad knowledge of poetic traditions. Louis was known locally as "Loo", but used the nom-de-plume "Backwoodsman" for his writing. Some of the poems in this book were published in local newspapers and broadsheets, others are held and treasured by the families for whom he wrote on special occasions, but most of them were in a hand-written book held by his daughter, Alice Annie McPhail, and her daughters, Alice and Barbara. The poems have been edited by Maisie Earle, Emeritus Professor of Food Technology at Massey University, a native of the Lochaber area of Scotland which was the original home of Louis McLachlan's parents. Examples of the poems can be found on this website, along with links to the launch of the book.